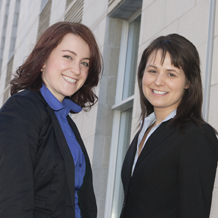 Andrée Lavoie and Valérie Gagné-Rousseau, both BBA 2008, tied for first place in the case examination of the Ordre des comptables en management accrédités du Québec (CMA), in August 2009. They will be presented with certificates of honour and a $2,000 prize at the 2010 CMA graduation ceremony on April 17, at the Palais des congrès. This is not the first distinction or award for the two HEC Montréal grads. Master’s student Andrée (on the left in the photo) was in the Mercure track in the BBA, and is currently on the honour roll for the MSc in Controllership. She has received a travel bursary from KPMG, a merit scholarship from Raymond Chabot Grant Thornton, along with an internship, and the CMA award, as well as the Master’s Program Director’s scholarship. Andrée has been a student teacher in the Department of Accounting Studies since June 2008. Valérie, who was a student teacher from June 2008 to September 2009, is now an advisor, budgets and control, with Gaz Métro. She received two merit scholarships from Ernst & Young, a merit scholarship from Raymond Chabot Grant Thornton, along with an internship, and an entrance scholarship to the School. This award from the Ordre des CMA is in addition to another award she received from the Order when she entered the program. The two young women agree that their remarkable success on this provincial exam was due to the quality of the education they received at the School, and their ability to creatively analyse the cases. They will have to complete a second examination, a written report and an oral presentation to a simulated board of directors, before they receive the CMA designation.